A top flight website design was needed for legal recruitment agency Duke and Rawson. After a meticulous and detailed briefing, our designers came up with a design which fitted their branding perfectly. A subtle palette of greys and matching red ensures that this website looks classy and is easy to read. We sourced and supplied the quality imagery used throughout, and created the slides used in the home page slideshow. Great attention to detail was paramount and with the minimum of fuss we worked very closely with the client and made sure we crossed the t’s and dotted the i’s! 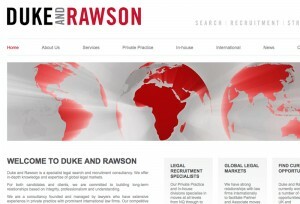 Duke and Rawson are very happy with the design and say that it’s just what they wanted.